Beljan Development, the company behind the Crawford Block (home of Holy Roller, El Cortez, and Have Mercy), and Oliver Exchange (soon to house Brio Bakery, Culina Grab and Go, and Iconoclast Coffee), is working on bringing the trendy food hall concept to Edmonton. They’re planning to include food halls in the redevelopment of the Strathcona Hotel and the YMCA building downtown, with the latter, called Williams Hall, set to open in Fall 2019. Jack’s Sandwich Shack has replaced Ong Hanoi Style Fried Chicken at 15 Perron Street in St. Albert. Signage just went up announcing Ice District locations for Guru and Delux Burger Bar at the base of the Edmonton Tower. The next Swine and Dine will be held at Salz on February 11, 2019. Tickets for the three-course menu are $40. The annual Winefest returns to the Shaw Conference Centre on February 15-16, 2019. Tickets to the all-inclusive event start at $87. NAIT is hosting their inaugural Cook, Butcher & Baker Food Competition Showcase on February 23, 2019, featuring the top students from the Department of Culinary Arts & Professional Food Studies. Tickets are $50. The wildly popular medicinal plant walks with herbalist Robert Rogers always sell out – tickets for his events on July 9 and August 7, 2019 are available on EventBrite through The Local Good for $60. Sharon checked out the newly-opened Artisti Pizzeria in Holland Plaza, and enjoyed the desserts more than the pizza. The Journal was pleased with the food and service at Aarde. Twyla found the fare at Copper Branch to be middle-of-the-road. Linda loved the food and the vibe at Brown Butter Cafe. Crystal was impressed with the food at Old Town Pub on Whyte Avenue. Andrea provides an overview of the new dishes on the revamped menu at Wilfred’s. Stephanie checked out Century Casino’s Vee Restaurant in St. Albert. Chef Steven Brochu is leaving Chartier in February to helm his own cafeteria and catering operation. There’s a new brewery tour in town: Canadian Craft Tours, who leads tours in BC and Calgary, is launching brewery tours in Edmonton. Speaking of beer, The Local Good has a great resource mapping out establishments who have at least 40% of their taps devoted to Alberta beers. Star Metro published a piece about a ghost kitchen operating in Edmonton, though I’m not sure it’s the first – after it closes its doors to public in mid-February, Solstice Seasonal Cuisine will still be offering food through delivery apps. The latest webisode of Fast Food features The Commodore’s Chef Megan Gee and her kimchi fried rice. Send a sweet gift that will also benefit charity: Bloom Cookies will be offering Cookie-Grams for Valentine’s Day, with $5 from each $28 box going towards the Sexual Assault Centre of Edmonton. On a related note the Local Good recently profiled Bloom. The most recent NextGen vlog highlights Cafe Linnea. Sylvia Cheverie from Chartier is interviewed on this week’s episode of Let’s Do Coffee, a podcast about entrepreneurship. The Alberta Farm Fresh Producers Association is offering an Introductory Fruit Production workshop, all about fruit production and its economics in Alberta. Tickets are $50. The new Canada Food Guide has finally been released. For the most part, the reviews have been positive, and I’m a fan of the healthy eating habits included along with the food guidelines (here’s one opinion, from Food Network chef Laura Caulder). CBC’s Great Canadian Baking Show is accepting applications for their third season. The deadline to apply is March 10, 2019. 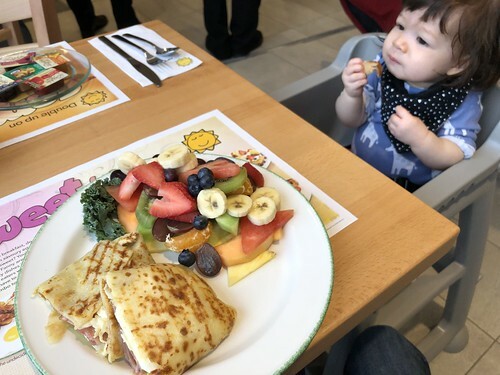 Congratulations to Cora’s who officially opened their downtown Edmonton location on Wednesday, located at 10041 106 Street (in the Days Inn). Emily and I were happy to be part of the festivities! I’m always happy to see more ramen options available in the core, so I had to try Jang’s version, available on their lunch menu. 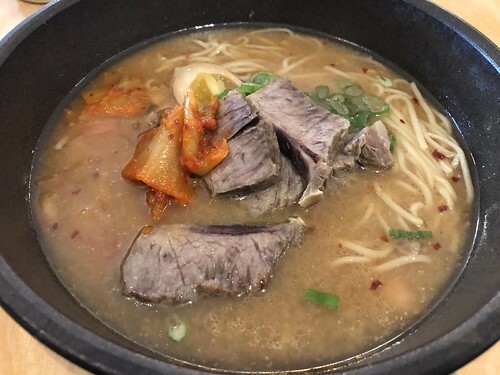 I loved the miso beef broth, and of course, the house-made noodles were perfect, as would be expected from the sister restaurant to Nudoru. Mack and I found ourselves near the University of Alberta today, and took advantage of this proximity to check out the (no longer new) digs of Filistix in the Students’ Union Building. Their food always hits the spot, and I’m looking forward to their downtown location opening later this year (they’re hoping for April). 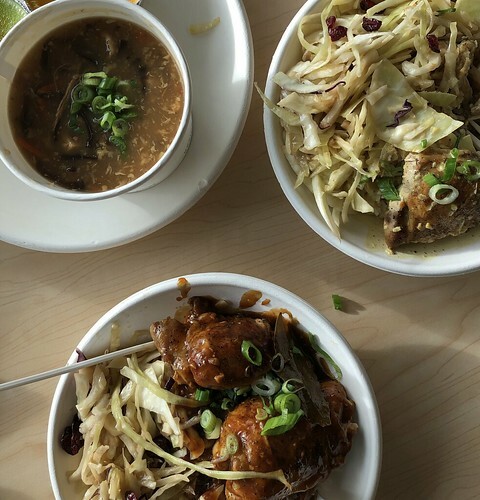 Chinatown Dining Week came to a close over the weekend. 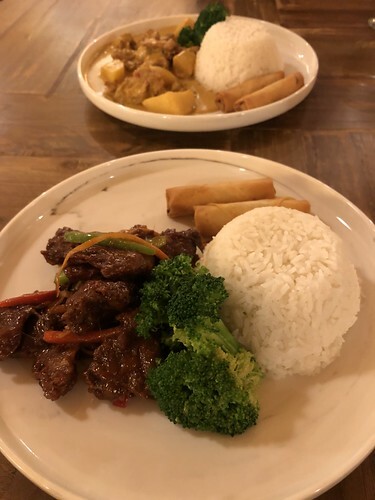 Mack and I snuck in one more meal at Padmanadi – it was a happy coincidence that my favourite dish (the ginger beef) made it onto the menu! If you attended Chinatown Dining Week this year, please consider filling in this survey – the results will help with the planning of future events. Thank you!